John Lennon would have been 70 years old on Oct. 9. For those whose college days came alive to the Beatles' music, that's an almost unbelievable statistic. One advantage of dying young — Lennon was only 40 when he was murdered on Dec. 8, 1980 — is that the victim remains forever young in memory. 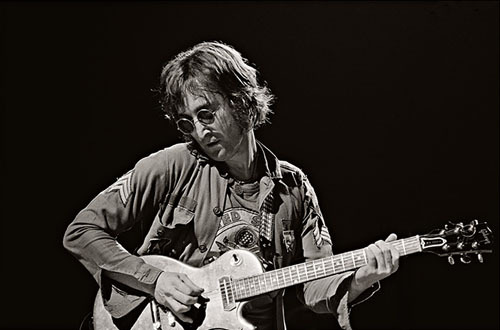 Brian Hamill, for instance, is a longtime celebrity photographer who's aging, like the rest of us, but who has indelible memories of the three intimate sessions he had with Lennon in the '70s. Fortunately, his memories are on film. Many of the photographs from those sessions are being shown in an exhibit opening today at Monroe Gallery of Photography on Don Gaspar. 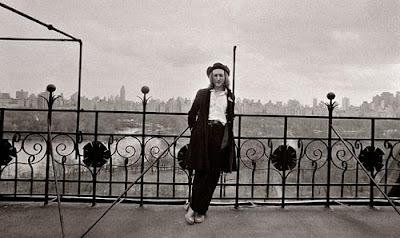 Hamill has written movingly abut his memories of Lennon in a blog on the Monroe website. "... 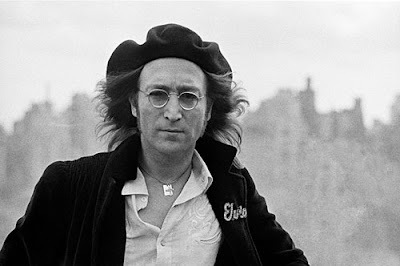 I will always remember John Lennon as a quick-witted, vulnerable, stand-up, soft-spoken but unafraid guy," Hamill wrote. "In my short time hanging with him, he spoke only the truth. I only spent time with him twice. I photographed him three times. They were all as memorable in my brain and in my heart as the awful day when he got murdered by a two-bit swine. On Dec. 8, 1980, I was sitting in a rocking chair of my living room at my country house in Rhinecliff, N.Y., holding my 3-week-old infant daughter Cara in my arms. Just the two of us were there, listening to music together on the radio, me with the goofy faces and smiles and the baby talk, when suddenly the music was interrupted by a bulletin stating that John Lennon had been murdered. Projectile tears instantly shot out of my eyes onto my beautiful daughter. I had never cried like that. They were such immediate, forceful tears. I will never forget the combination, a one-two punch on the chin, of celebrating the wonderful joy of fatherhood one moment that was completely shattered in a split-second moment by that painful, horrible news bulletin. John Lennon, dead!? Nooooooooooo!... for my generation, for many generations, he was a major musical force and a phenomenal creative icon of the 20th century who influenced the world. No doubt about that. Everybody knows." Brian Hamill has moved among the famous for most of his career, and this exhibit shows that, according to Sid Monroe, gallery director. Monroe Gallery specializes in classic black and white photography with an emphasis on humanist and photojournalist imagery. The gallery features work by more than 50 renowned photographers and also represents a select group of contemporary and emerging photographers. Hamill was born in Brooklyn, NY and studied photography at the Rochester Institute of Technology. In the late 1960s, he began a career as a photojournalist covering the rock 'n' roll scene as well as the boxing world. He also worked as an assistant to several top fashion photographers. In the early 1970s he traveled to Northern Ireland to photograph the troubles there, and widened his scope into unit still photographer jobs on movie sets. Since then, he has worked as a unit still photographer on more than 75 movies, including 26 Woody Allen films, resulting in a coffee table photo book titled "Woody Allen At Work: The Photographs of Brian Hamill" (Harry N. Abrams, 1995). The redoubtable director is in fact quoted marveling at Hamill's ubiquitousness: "His currency is knowledge, information, connections, street smarts. There's not a person he doesn't know or he doesn't have the skinny on or know about, not a restaurant, not a broad — it's really quite astonishing." Hamill's work also has appeared in other books, publications and exhibitions, including a one-man show at the Academy of Motion Picture Arts and Sciences in 1995. In 2005 he had solo exhibitions in New York City, Los Angeles and Austin with his images of John Lennon, Muhammad Ali, Mick Jagger, Robert DeNiro from "Raging Bull" and Woody Allen from "Manhattan." In addition to his movie work, Hamill has an extensive file of photographs that includes the "Troubles In Northern Ireland — 1972," rock 'n' roll, boxing, travel photographs from around the world, and a collection of nudes from the 1970s to the present that he plans to include in a forthcoming book. 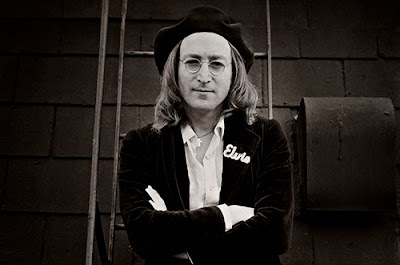 He still mourns the gentle music man he met in those Lennon sessions not long before the singer-songwriter's tragic death. "John Lennon never got to fully mature as a man," Hamill writes. "The dude was only 40 years old! He never really got to bring his full genius to all of us, although he certainly brought us some real genius. He never got to share more of that fun and laughter and wackiness with Yoko that we all were lucky enough to glimpse in a small way, and you certainly know a lot more of that was on their horizon. He never got to spend a lot of quality time with his nice sons. Yet he gave us all so much. Those John Lennon tears of mine will never fully dry. He will be missed forever." Exhibit continues through Nov. 21. Related: LENNONYC at The Santa Fe Film Festival Saturday, Oct. 23. Ticket info here. Brian Hamill will introduce the film and take part in a panel discussion afterwards.